NEW YORK CITY – The Silver Institute has released a report saying global silver demand rose 4% – to 1.03 billion oz. – in 2018. This is the first time since 2015 that demand has risen year-over-year. On the demand side, sales of silver bar and coins rose by 20%, the largest driver was silver bar demand, which jumped 53%. Silver jewelry demand moved up 4%, to 212.5 million oz. Demand for industrial silver fell 1% to 578.6 million oz., due to a 9% drop in silver used in photovoltaic. The price of silver also declined by 7.8% to average US$15.71 in 2018. Negative factors affecting the price last year included a rising U.S. dollar, interest rate hikes, the trade dispute between the United States and China, and lower global economic growth projections. 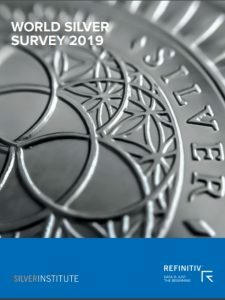 Details are available in the Institute’s World Silver Survey 2019 at www.SilverInstitute.org.